For 19 seconds, several times a day, a soothing lullaby floats through Novant Health Presbyterian Medical Center in Charlotte, North Carolina. 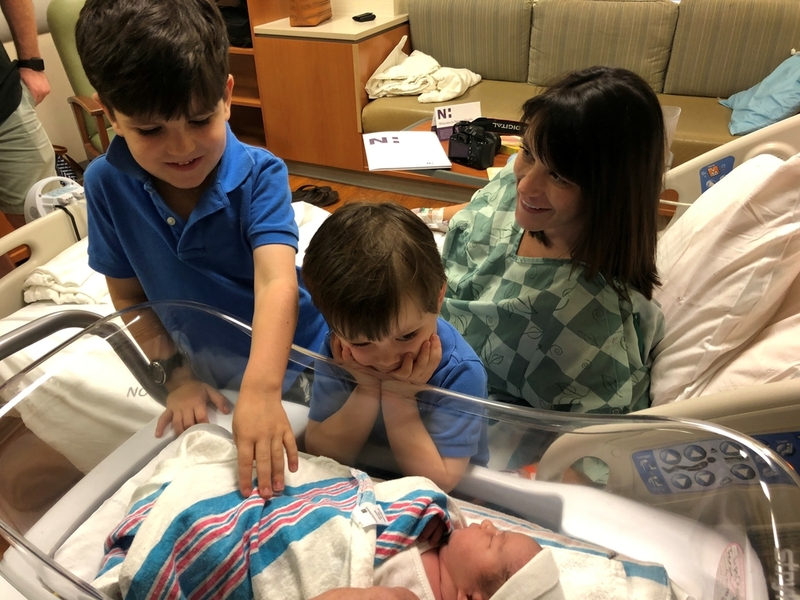 The exact scene plays out dozens of times a day in Novant Health hospitals from the North Carolina coast, to small towns, to Charlotte and the teeming suburbs of Washington, D.C.
A baby has been born. The sweet music signifies and celebrates the beginning of a new life. The soft melody – titled “Brahms’ Lullaby” - sparks joy for those in the building who know what it means. The tune has stopped visitors in mid-bustle. German composer Johannes Brahms wrote it 150 years ago. Pat Campbell adopted it for Novant Health in 1997. It’s been a staple at Presbyterian ever since, easing through hallways and lobbies from five to 25 times a day. Pat Campbell initiated Brahms' Lullaby at Novant Health in 1997. Robin Lipe knows the lullaby well. Two months ago, she gave birth to her third child (daughter Elizabeth). A nurse had activated the wall key – tucked away in the eighth-floor hallway – when Lipe’s sons Hunter (age 5) and Jack (4) were born. After Elizabeth’s birth, the Lipes were being transferred from labor and delivery to a postpartum room. That route, typically taken 1 to 3 hours after birth, passes by the lullaby key. The traffic stopped and a nurse turned toward daddy Scott Lipe. “He was all excited,” Robin Lipe said, laughing. 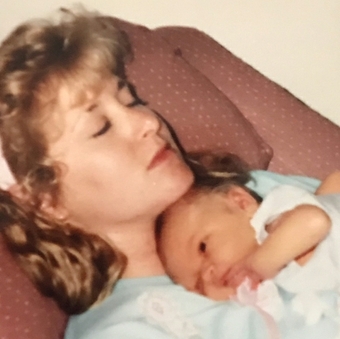 Campbell borrowed the Brahms’ lullaby idea when she learned other hospitals used it. She thought the music sounded “amazing.” Figured it was low-cost and (correctly) would have a very positive outcome. The rules are simple, and flexible because nobody complains when babies are born. No music between 9 p.m. and 7 a.m. (rest time). Each family decides who turns the key to trigger the song, and when. Sometimes it’s delayed until older siblings arrive. Or maybe when out-of-town relatives bounce in. But is there a second key turn if someone’s plane is delayed, or friends show up in waves? 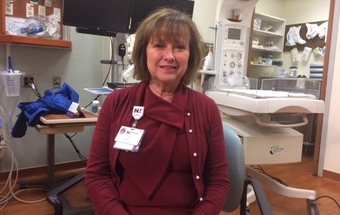 “Of course,” said labor and delivery nurse Lisa Webster, who has been with Novant Health since 1987. Webster and fellow nurse Toni Piercy, who also has been at Novant Health since 1987, have heard the lullaby thousands of times. 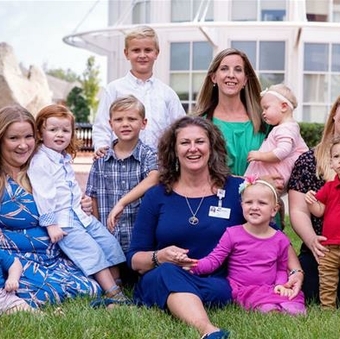 It remains special for them because not long after it was established, newborn nursery nurse Lisa Davis Allen died unexpectedly. 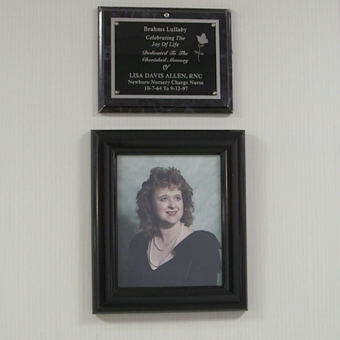 Novant Health's lullaby is a memorial to nurse Lisa Davis Allen. Allen’s colleagues approached Campbell about dedicating the lullaby tradition to her memory. There’s a plaque honoring Allen on the wall outside the nursery. Novant Health Brunswick Medical Center: A nurse activates the tune, which is heard throughout the facility. In September, the lullaby played for the baby who was born here while the facility was on lockdown during Hurricane Florence. Novant Health Culpepper Medical Center: The lullaby is heard throughout the hospital after every birth. Novant Health Forsyth Medical Center: No music is played. Novant Health Haymarket Medical Center: The lullaby is activated, usually by a labor and delivery nurse, by dialing a telephone extension. It is heard throughout the hospital. Novant Health Huntersville Medical Center: The lullaby plays when the patient is being discharged. It is heard throughout the hospital, but not in patients’ rooms. The family decides who gets to turn the key to begin the music. Novant Health Matthews Medical Center: A hugs (infant security) tag is placed on the child immediately after birth. Then, the medical unit receptionist initiates the lullaby to play throughout the building. The parents or anyone in the family can ask for it also to be played later, for example, like when a sibling visits for the first time. Novant Health Mint Hill Medical Center: The family chooses who gets to push the button to play the lullaby. 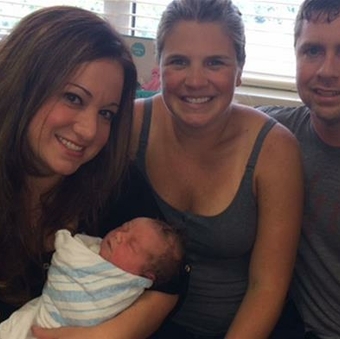 It is heard throughout the new hospital, which delivered its first baby Oct. 4. Novant Health Prince William Medical Center: Usually, a labor and delivery nurse activates the lullaby via a telephone extension. Novant Health Rowan Medical Center: One of the new parents presses the button to activate the lullaby on their way to the hospital’s postpartum unit. Novant Health Thomasville Medical Center: No lullabies are played after 9 p.m., as to not interrupt patients’ rest. The song is activated by the mother – or someone she designates – by pushing a button as she’s leaving labor and delivery, headed to her postpartum room. The maternity specialists at Novant Health are here to ensure you and your baby get the personalized care you need from prenatal care to delivery — and beyond. Your journey starts here with our birth preparation guide.